Someone is wanting to remind the public of Sophie's debts while she is living a grand lifestyle. Thankfully, the article is 14 years too late and I can't imagine the public having a particular interest in it. Indeed. What a strange, bitter little article, with no new information whatsoever (and even the background information is scant). Seem like the author of the article was looking for something, anything to write about. Also, it's dated from a couple of weeks ago, and hasn't really gained any traction, so I think you're right about lack of interest. Wow...Not only bitter, but written in a rather bumbling all over the place style too. How this so called writer thought they'd be taken seriously after anyone reading ii is rather mind blowing. I smell someone oh so badly wanting to be that next highly lauded big shot Investigative Reporter that breaks stories about shady dealings behind the scenes in Government or, in this case, The Royal Family. Not only did they miss the mark by more than a few years, but no reputable News Outlet after reading that mess would take this person on as a reporter. Even on the lowest possible level. Its obviously old news now but it was a major scandal at the time and for some newer royal watchers its a lesson in just how difficult it can be to adjust to royal life. Edward also received a scolding from the Prince of Wales for filming William at St Andrews university. This is what forced Edward and Sophie to abandon careers and take up royal life full-time. Yes, it was a very big story at the time, and I think there's an interesting story to tell there (and does come with an interesting lesson - not just in terms of adjusting to royal life, but also in terms of how the British media operate.) The problem is, that article doesn't do a good job of telling the story and also seems to be more focused into trying to make it sound like an ongoing controversy when it's really over and done with and has been for years. Also, I may have this wrong (because - surprise, surprise - the media had some conflicting accounts of this at the time), but I think it turned out that a camera from Edward's TV production company was filming somewhere in the town of St. Andrew's after most of the media had left. Edward wasn't there and the camera wasn't following William (I think they were interviewing locals or something). The press tried to spin at as a story of Edward stalking poor William, and, conveniently, this all happened less than six months after Sophie got caught up in the fake sheikh scandal. For a while there, Edward and Sophie were real punching bags for the media and, given their lives now and the media coverage (or, rather, lack thereof) that they receive, it's certainly interesting to look back at that period. ^^^ Oh you're probably right. I just remember reading snippets in the newspapers. I haven't really followed Edward and Sophie over the years. This article was very random indeed and so inaccurate. "The reporter presented himself as a potential client of the PR firm she was running with her husband, Prince Edward." Since when did they run a PR firm together? It's laughable how terrible some articles are. Sophie made a huge mistake at the time but the "Fake Sheikh" also made a mistake in abusing his position. Neither of them, nor the newspapers etc., were in the right and sadly the News of The World did not learn from their idiotic mistake. Sophie, however, did learn and bucked up her ideas. I think the time would have eventually come for the pair of them to give up their businesses and join "The Firm" as full timers; it just happened sooner rather than later. I had figured if and when Sophie had a baby she would have given up her business to spend time with her child/children. The Earl & Countess of Wessex along with royal family will attend service to mark the 70th anniversary of Victory over Japan Day in St Martin-in-the-Fields Church in London. Patron, England Hockey, will attend the Euro Hockey Championships at the Lee Valley Hockey and Tennis Centre, Queen Elizabeth Olympic Park, London E20. That's how I remember what had actually happened regarding that particular part of the mess too. I also remember reading about it in more than one actual news, not tabloid, outlet. Don't ask where as it's been a long time since it all happened. Same here and wasn't this also around the time Sophie lost their first due to an Ectopic Pregnancy? Those early years would have destroyed and shattered most Couples. It speaks volumes to how strong both the bond they share is and the people they are. Yes, you're so right, Tiggersk8. They're a strong couple indeed. It seems that, in royal circles, the longer the courtship, the better the marriage is. Yes, 2001 was a really rough year for Edward and Sophie.The Fake Sheikh episode occurred in the spring of 2001, and then the accusations about Edward's production company "stalking" William came in late summer, I think (whenever the academic year at St. Andrew's began.) Sophie suffered the ectopic pregnancy in December 2001. It must've been a hugely difficult time for them because, due to the scandals relating to their respective businesses, I think Edward and Sophie knew they would have to give up their jobs, and I suspect that they spent much of 2001 trying to wrap up their business commitments (which I think was a hard enough thing to do, since they had both founded their own companies and were, of course, very committed to them). Clearly they were trying to start a family, too, but by early 2002 they had announced that they were stepping down from their careers to be full-time royals, and their baby plans had suffered a serious setback (and they faced the possibility that they might not be able to have children at all). I remember all the headlines and scandals that Edward and Sophie were dealing with at that time, but it's when I look at things in hindsight that I think the same thing you do: the fact that their relationship withstood all of that is really incredible. It makes it especially nice to see that, all these years later, Edward and Sophie seem to be quite a happy pair, and they have a lovely family. I suspect those difficult early years must have brought the two of them even closer together. I agree with Mermaid1962 that a longer courtship certainly seems to benefit royal couples. Edward and Sophie certainly seemed to have a solid relationship before they married, and I'm sure the fact that they really knew and understood each other made it easier for them to get through the tough stuff together. 2001 is probably Edward and Sophie's "annus horribilis" - the ectopic pregnancy was the worst end to the year for them, and it was deeply shocking when it was made public. No one had had any idea she was pregnant as she was very early on, and had been asked the week previously if she was pregnant to which she gave no reply. It was a horrible year for them but I imagine it made them who they are today as a couple. Sometimes things like this can either strengthen a pair or weaken a pair and thankfully for Edward and Sophie it was the former. 20 odd years after their relationship started they look much happier than ever and I think it's great. You often see Edward holding his hand out to Sophie to assist her up and down steps which is a gentlemanly thing to do. It reflects his parents relationship in a way - when Philip helped the Queen down the steps after the service in March for Afghanistan it was lovely to see. I imagine we will see Edward continuing to do the same for his wife in years to come, and I look forward to call them the Duke and Duchess of Edinburgh. I also remember for her Diamond Jubilee "Thank You" speech recorded for TV, she chose Edward and Sophie's wedding photo and the Cambridge engagement photo to be in the background. These were chosen for a reason and I thought it was lovely to see them in the background. The Queen chooses the photos in the background and foreground of her speeches and to see her choose those photos was lovely. Yeah, I remember 2001 being really rough for them - in the eyes of the media, they couldn't do anything right. Looking back at some of that coverage today, it's crazy to see just how vicious the press was toward them (not that Edward and Sophie never made any missteps, but I think the coverage of them that year is a very good example of just how damaging the media can be when they decide to get worked up about something). The ectopic pregnancy was such a horribly cruel blow on top of everything that they were already dealing with. And there were some reports that indicated that Sophie herself hadn't even known she was pregnant (I remember that Edward was asked about that in the days after she suffered the ectopic pregnancy, and he declined to comment on whether or not they had known). I agree that 2001 was a kind of "make or break" year for them - they went through a lot of things that often cause couples to split up, and they went through so much of it in a very short space of time. I also agree that, these days, they actually seem happier than ever - even more so than when they were newlyweds. Edward and Sophie seem very much at ease with one another - they seem to laugh a lot when they're together and, as you mentioned, we see more of Edward making sure to take her hand to help he down some steps or whatever (which is something that wouldn't really be notable for most couples, but Edward's always seemed quite shy about making any kind of physical contact in public, lol). It's funny that you mention the Diamond Jubilee speech, too - I had just been watching the "Our Queen" documentary the other day, and it showed a snippet of the speech, and I had forgotten that the two strategically placed pictures behind the Queen were William and Kate's engagement picture, and Edward and Sophie's wedding picture. It was obviously deliberate and a very nice touch. It also reminds me of the fact that, while Edward and Sophie seem to be remarkably steady and supportive of one another, the Queen and Prince Philip have been very supportive of them, too. I remember that, in the midst of the Fake Sheikh crisis, the Buckingham Palace released a statement underlining the fact that the Queen very much supported Sophie, and that any reports stating otherwise were hurtful and untrue. The fact that Edward and Sophie are close to the Queen and Philip has, I'm sre, been a steadying influence in more ways than one. Ironic that the this couple had a rougher start to their married and royal lives than any of his siblings and their spouses, but are still going strong today. IMO they have what it takes to weather the storm and their relationship is likely stronger for it. You know you are growing up when your adult cousins hang with you on a railing and also hang on your every word. Lady Louise has grown so! I'm hoping/predicting a traditional but less child-styled coat, the end of anklets and Mary Janes or white tights for Christmas at Sandringham. Fingers crossed. That's a great photo worth keeping. That's a nice picture. Louise really has grown a lot lately, and it's particularly noticeable when you see her around Anne's grandchildren (especially because there are pictures of James playing with Savannah and Isla, whereas Louise seems to become one of the adults). She has grown up so much over the past year. She is becoming a young lady which is really lovely. She no longer has her chubby childlike cheeks and she is getting really tall. Her hair is such a beautiful colours of blonde and I imagine she will continue to dye her hair blonde as she grows up. Zara had really blonde hair as a child and it started to dark during her teenage years, which I think will happen to Louise too. Sophie continues to dye her hair blonde so I reckon Louise will too. I love that photo because the trio are sitting in the same way and it also demonstrates Louise's uncanny resemblance to her father. Louise and Edward - They even walk the same way! She is the image of Edward - no paternity test needed there! The jury is still out on James! I am of course joking; James looks more like his mother's side of the family and he has her dimples. Really lovely and hartwarming pix. 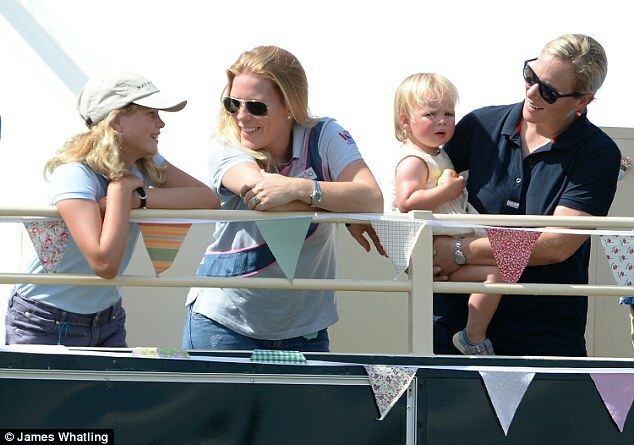 Louise is a real natural beauty, I love these two families, they seem to enjoy their company so well ! James is, as usual, nothing short of adorable (I don't know if anyone posted pictures of him in this thread yet). I used to not be able to figure out which side of the family he resembles, but at some point recently I came across some pictures of Sophie with her nephews when they were a bit younger, and James looks a lot like Sophie's younger nephew. And I think he seems to look more specifically like Sophie the older he gets (though he sometimes looks a bit like Edward, too). It's nice to see more pictures of Louise and James as they're growing up, but now I almost feel like they're growing up too quickly - every time I see a picture of Louise, I think "there's no way she can be so grown up now - I must be getting old!"